Home / Where Are You From? Mam Joof: Stewardship Coordinator at Community Food Centres Canada, Fellow in the Fellowship in Inclusion and Philanthropy Program. Lucia Ly: Fund Development Officer at Sandgate Women’s Shelter of York Region Inc., Fellow in the Fellowship in Inclusion and Philanthropy Program. 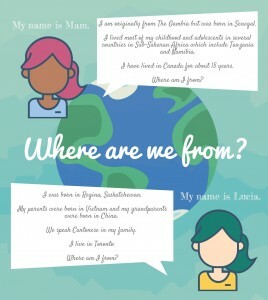 When meeting or getting to know someone, the question “Where are you from?” (or some version) often comes up. While we believe that most interactions come from a genuine place where people just want to get to know each other better and are curious to know where we are from, our backgrounds, our ancestry, who we are, sometimes these questions come loaded – with preconceptions of where we think someone is from or an assumption that a person is “foreign” based solely on their looks. It wasn’t the first time Lucia had had a conversation like this nor was it the last. Both travelling abroad and at home in Canada, it was normal to hear the question. And conversely Lucia had asked the same of the people she met. So what’s the problem? The problem does not lie in the question itself but in the context or intention. Why are you asking? Are you asking to confirm your assumptions about the person? Are you asking because they “look different”? Or are you asking because you are genuinely interested in hearing the person’s story? Mam and her brother have been asked this kind of question many times and the conversations surprisingly (or not surprisingly) have the same theme. While those topics are sore for most Africans and important to discuss, what is upsetting is that the conversation usually ends there. If they were to ask Mam what her background or roots are, she would say that she is from a small country called The Gambia in West Africa, which is nowhere near South Africa. Even the kind of wildlife is made up more of birds than carnivores. As fundraisers, we meet new people all the time. Networking, schmoozing, stewarding…all requires us to learn more about the person we are meeting and building a relationship and rapport with them. By knowing where people are from, we get to know their stories, their backgrounds, their experiences, their values and their interests. And these days, as we have learned, our stories are not so simple. Where we are from can be made up of different layers and identities. It is not a simple question and the answers are definitely not so simple. At the end of the day, we all need to make a conscious effort to learn about people without making preconceived ideas or assumptions – or at the very least be open to freeing our minds and ears to what the person is telling us. To be completely honest, we have all been there. We have made mistakes. It’s time to learn from them and find ways to change the tone of the conversation. Instead of asking where someone is from next time focus on the context of the conversation. Every interaction is different and we admit the question can bring out interesting conversations but it can also bring about strong assumptions. Therefore, next time you want to ask “So…where are you from”, ask yourself whether it is relevant to the conversation and if your intentions are sincere.